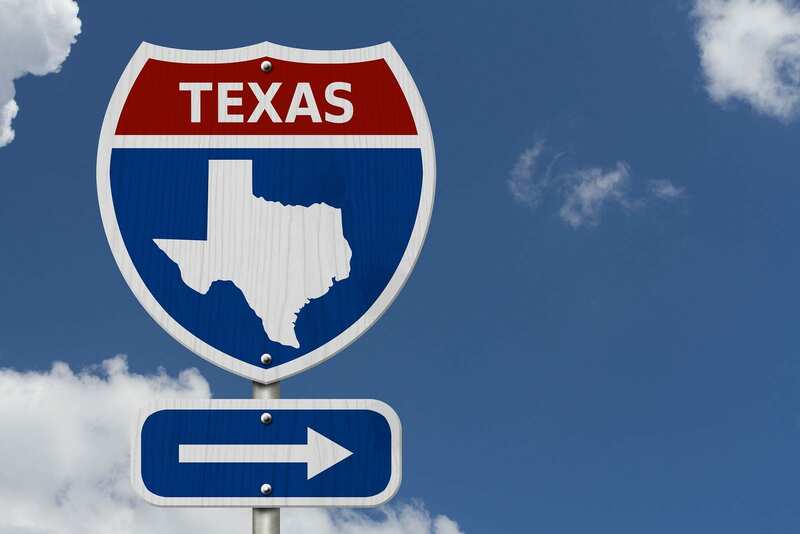 WalletHub released a new study of 2018’s best real estate markets and the state of Texas comes out on top. With 7 cities making it into the top 15 markets on the list, the Texas real estate market seems to be one of the best states to invest in real estate. Never considered buying a house in Texas for investment? Let’s explore this study and the market further to see if buying an investment property here is truly a sound choice. In fact, it can be quite difficult sometimes to label real estate markets as such, because many factors come into play. According to WalletHub, if an investor wishes to enjoy long-term growth, equity, and profit, buying an investment property in one of the cities on the list is a smart move. How Were the Best Places to Buy Rental Property Selected? Of course, other factors were taken into consideration to come to these results such as number of foreclosures, vacancy rates, and even median credit score. What is most important to note is that these findings were not based solely on ROI (return on investment). In fact, some of the Texas cities listed below even have a “Real Estate Market Rank” higher than 10 (1 being the best) according to the study. However, with the right tools, you can easily find high cash on cash return investment properties in each of these markets. For the larger cities in the nation (more than 300,000 people), Fort Worth, TX comes in at #3 and Austin lands #8. For mid-sized cities (150,000-300,000 people), McKinney, TX is #1 and Irving, #6. And for smaller cities (under 150,000 people), Frisco, Allen, Richardson, Denton, and Carrollton all make it into the top 10. This is another major indicator of the success you can find as a real estate investor in the Texas housing market. So, let’s look at the major reasons these cities have ranked so high in this in-depth analysis before we look at the winning cities to invest in. With data from Zillow, we can get an idea of the overall condition of the Texas real estate market. The low inventory is unable to keep up with the increasing demand. Even though property sales dropped earlier in 2018, July showed an increase of 3.8%. The days on market for the state was 56 in July. Demand is high across all price ranges thanks to the thriving economy, which we investigate next. Driven mostly by the energy industry, Texas’ $1.6 trillion economy is on an upward climb. Over 350,000 jobs were added this past year alone. Compared to the rest of the nation, 1 in 7 jobs created in the US was actually created in Texas. Even though it’s not the most populous state in the country, it is definitely one of the fastest growing. With the population at around 28.3 million in 2018, experts predict the numbers to reach over 29 million in 2019. Overall, the economic health and impressive job and population growth all typically lead to positive real estate market trends like the ones we are seeing across the Texas housing market. Note: Be sure to always check Airbnb regulations by city before choosing Airbnb as your rental strategy. Ready to look for rental property in 2018’s best real estate markets in Texas? We can show you how. Looking for More Affordable Investment Properties? While the median property prices listed above are relatively affordable, you already know from Zillow’s stats that Texas has some over-valued properties. 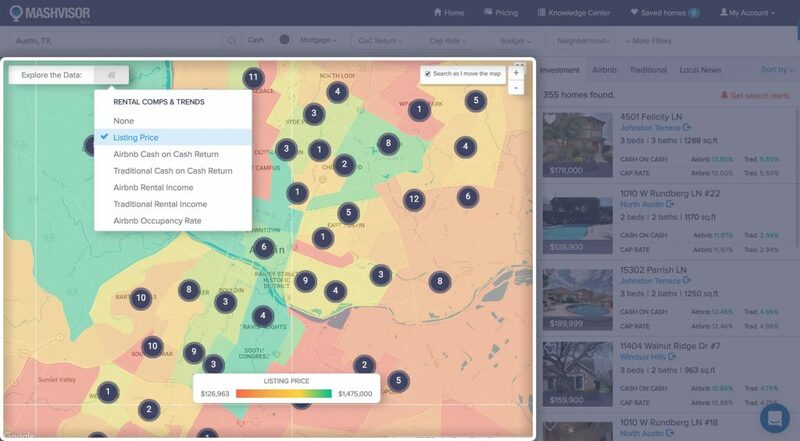 Use Mashvisor’s heatmap tool (pictured below) to find neighborhoods that have more affordable property. Learn all about this tool here. Want High Cash on Cash Return? What we all really want is to be making money in real estate with a good return on investment. For this, use Mashvisor’s property finder tool (pictured below). 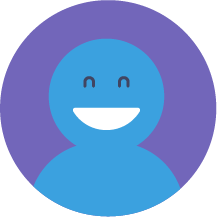 Learn how this tool works for you here. If a state ranks for 7 out of 15 spots in the top markets across the nation, it should pique your curiosity as to what kind of real estate investments are there. Start looking for investment property in the Texas real estate market with Mashvisor’s tools by clicking here. Still not interested in investing in any of these cities? Here are 8 more to consider. Airbnb Rentals or Traditional Rentals? This Tool Will Help You Decide! How Does the Atlanta Real Estate Market Look Like for Investments at the Beginning of 2018?